Express Glass & Board Up (http://www.expressglassfl.com/), one of the top sliding door replacement services in Fort Lauderdale, Florida, is proud to announce an exciting March, 2016, offer for local homeowners and businesses: a 10% discount offer on replacing sliding glass doors of all types. The offer is open to new customers who either visit the website directly or mention the Fort Lauderdale sliding glass door offer when calling in over the telephone. To avail oneself of the offer, interested parties are advised to click on the red 'estimate' button and mention the Fort Lauderdale 10% discount on sliding door replacement either via email or by calling directly over the telephone. The offer must be mentioned before service is performed. Fort Lauderdale residents and business owners normally prepare for the spring season by cleaning out outdated items. The practice of cleaning out old items may include choosing simple upgrades that bring a fresh new look to a property. Looking through foggy glass or old patio doors may mean the upgrade begins with sliding door replacement. Replacing sliding glass doors can increase property value and offer better security. Express Glass reminds the Fort Lauderdale community that choosing sliding door replacement can be quick and budget-wise. Upgrading sliding glass doors can enhance Florida’s lovely views and provide better security. A beautiful Florida view in the springtime is a great addition to a home or business. Express Glass and Board Up Service Inc. is a family owned and operated glass repair business with more than 20 years of experience. Professional technicians and the large variety of inventory make Express Glass the top glass repair service. If customers are looking for sliding door replacement in Fort Lauderdale, or Miami glass repair, as well as window repair in Delray Beach or West Palm Beach glass door repair, please reach out to the company for a free estimate. 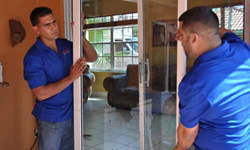 If customers need a 24/7 Sliding Glass Door repair service in Ft. Lauderdale or Boca Raton or Miami, technicians are standing by. The company specializes in sliding glass door repair, storefront glass door repair and replacement. Home or business glass repair is the company's main priority.